They say owners resemble their dogs, well, I would argue football clubs resemble their managers as well, at least in terms of their style of play. And, I think it’s also fair to say, there have been a few hounds doing the rounds at certain Premier League Clubs this season. Woof! Woof! Messrs Pardew and Hughes. 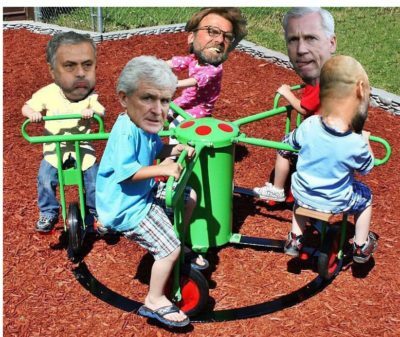 In this picture of managerial merry-go-rounds, there has only been one manager in total control of their team this season, leaving the others far behind, scrambling around in the school playground of life. 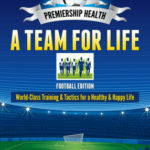 Whoever’s in charge of your club, the tactics they use and the communicational skills they possess, has a profound effect upon how well a team plays, and ultimately the health of the Club. Likewise, how an individual manages their own life is crucial to the health of their club and if we want to be successful, we need to be in conscious control of all our players and how well we communicate with them. So, here is my irreverent end of season health report for most of the Premier League Clubs. They have strengthened in the right areas, and produced a team which is both difficult to score against and attractive to watch. Pep has focused on building a solid defensive unit and the lynchpin has been a world record investment in an outstanding goalkeeper called Ederson (£34.9M). This player not only possesses great shot stopping ability, but also has superb decision making skills, coupled with an intelligence to read the game and organise the defence. Man Utd. – The bigger brother of ‘Citeh’ is not enjoying such robust health as its sibling rival – showing the early signs of pre-senile dementia. Not only does the manager keep forgetting which players he has sold (Lukaku, Saleh and De Bruyne), but many would say he is also losing his sense of direction. The lacklustre play of the team for most of the season at Old Trafford has created a mood which swings between apathy and abject boredom and it seems Mourhino is increasingly confused about what constitutes his team’s best strike force. Liverpool – With the camera endlessly focusing upon Klopp gesticulating and gallivanting up and down the sidelines you could be forgiven for thinking the guy was suffering from a mild form of attention deficit hyperactivity disorder. Is it any wonder then that watching Liverpool play this season has been both an exhausting and exhilarating experience. Sometimes the defence switches off, often late in the game, allowing the opposition to score and other times the pressing and energy of the players is irrepressible, creating goals of majestic magnificence. Spurs. I fear for the ‘spuds’ – heading for a metabolic midlife crisis not dissimilar to the “Arseholes” down the road. The building of the new stadium is likely to see the Chairman holding onto as much “belly fat” cash as possible, which will mean a few star players leave for pastures new, and I suspect the manager will quickly follow. Chelsea. A team and manager suffering with Pituitary Insufficiency (hormonal deficiency) as the communication between the manager and Chairman breaks-down, rendering the manager impotent and the team short on muscle and potential for growth. Under such circumstances the energy levels drop, stress levels go up and the players fail to perform, causing the manager to lose his hair and show signs of ageing. Burnley – It’s been a bloody Marvellous season for Sean Dyche and the Clarets of Turf Moor. With a strong defensive unit and the emergence of a young talented goalkeeper in Nick Pope, they have become a very difficult team to beat. Combine this with a manager who is capable of getting the most out of his players, and you have a team performing like a middle-weight boxer, standing toe to toe with the heavy-weights of the Premier League. They may be a skinny Club, at least in terms of resources, but, pound for pound their punching power has been mightily impressive and as a result, Sean Dyche has been able to get on with the job in hand. Everton – The Toffee men, have been the bipolar team (manic depressives) of the Premier League for some time. The season started off on a high with an up and coming manager at the helm and a few big name signings, including: Rooney Sigurdsson and Walcott. Newcastle. A club doing its best to get healthy again, with a top-class manager in control, who, unlike others before him can actually communicate with the Chairman of the Club. Brighton. The Seagulls (sorry, there is only one Albion) have an ambitious risk-taking Chairman and a manager, Chris Hughton in charge, who places great emphasis on two aspects of management; training and discipline. West Ham – If the “Gooners” are on the verge of diabetes, then the West Spammers are fully blown type 2! The greed of the Chairman has left the Club playing in an unnecessarily bloated stadium (body) and the terraces are filled with so much fan resistance, that tempers continuously run high with predictably destructive consequences. Swansea. The Swans, like their namesake, have had a stressful time trying to keep their heads above water. The two managers this season, Clement and more latterly Carvalhal, have had a year worrying about relegation and attempting to put out fires, more concerned with losing than scoring goals. Stoke. Sorry Stoke City fans, the jokes on you this season, except you won’t be seeing the funny side of it, as your Club descends into a deep depression. Under Hughes, the players lost interest in training, some even dabbled with drugs and drink and eating oatcakes to their hearts discontent. In truth though, Stoke have been on a downward spiral for a number of years, really since the negative boring footballing days of Tony Pulis (I feel your pain) which left the fans in a catatonic stupor. The people of the potteries are a resilient bunch however, they just need to find a manager who can communicate with the players and install some passion and pride into the team once again. West Brom. For the “Baggie Boys” the “Chateauneuf de Pape” has been well and truly flowing this season. Under Pulis and then Pardew they’ve forgotten how to score, how to defend and more poignantly how to win, before finally losing all leave of their senses on a sundowner taxi ride in Barcelona. This has been the year when the team finally succumbed to the destructive demons of dementia. Looking back the early warning signs could be seen at the end of last season when Tony Pulis began coasting once the goal of 40 points had been reached. The decision not to blood younger players and inject some life force into the team, proved a costly mistake, because when you stop developing and making new connections, that’s often when the nullifying decay starts setting in. Then the death of Club hero Cyrille Regis, at the turn of the year, struck a thunderous bolt through the hearts and minds of Albion fans all over the world. No longer would our iconic goal-scorer bestride the hallowed turf and provide his comforting smile. We were now alone and subjected to the comical confabulations of a clown called: “Pardew,” babbling his way through team talks and hallucinating his own superficial magnificence. Thankfully, the long term memories of a glorious and exhilarating past remain and short term misery is just a fleeting reminder that whatever we achieve in life, whatever success we have, is not done alone, but as part of a team, a family. For the three teams facing relegation from the Premier League, I offer this sincere and solemn prayer. Let us not forget that when the mighty are fallen it is bestowed upon the fans to provide the love and support that is needed for the team to rise again like a phoenix from the flames and keep the spirit and soul of the Club burning strong, and retain the power and the glory, forever and ever, amen! Play Well, Keep your Teams in Shape and Take Care! ← The Arsenal Revolution – Liberty, Equality, Fraternity!